Human AKI is manifested by inflammation, and an early feature in the pathogenesis is the accumulation of immune cells in the kidney. To understand the pathophysiology of AKI, results from animal models have shown a causal relation between the leukocyte activation and infiltration to the kidney after kidney ischemia-reperfusion. Blocking the activation or trafficking of proinflammatory leukocytes into the kidney preserves renal function and histologic integrity. In contrast, the anti-inflammatory lymphocytes called regulatory T cells have an intrinsic renal-protective function and may represent a novel therapeutic approach and/or target for pharmacological manipulation to ameliorate AKI. This review will highlight the recent insight gained into the role and mechanisms of regulatory T cells in AKI. AKI is a common problem in hospitalized patients, and it affects >5% of all inpatients,1 with rates of 40% or more in those patients who are critically ill.2 AKI significantly increases the risk of chronic renal disease, ESRD, and death, presenting a major burden to patients and the health care system.2 Because of its high metabolic activity, caused, in part, by the handling and transport of filtered ions, amino acids, and other small molecules, the kidney is highly susceptible to acute injury from exposure to and accumulation of nephrotoxic substances or lack of sufficient perfusion. One common response of renal cells to injury is the production and/or release of proinflammatory proteins. Modulating the immune system’s response to the proinflammatory signals produced in the injured kidney can have a profound effect on the extent of renal dysfunction and tissue damage. Whereas a great deal is known about the cells and other mediators in the immune system that contribute to and extend renal damage after an insult,3 recent studies have begun to illuminate the role of regulatory T cells (Tregs), which suppress renal inflammation and preserve renal function. Tregs are generated in the thymus in response to self-antigens and regulate peripheral tolerance. Identified initially as CD4+CD25Hi cells, Tregs are now defined by expression of Forkhead Box P3 (Foxp3) (Figure 1).4–6 Tregs critically depend on IL-2 for survival and function, and loss of functional Foxp3 or IL-2 signaling results in Treg deficiency and lethal early-onset inflammatory disease (reviewed in ref. 7). Tregs can also be induced from naïve T cells on antigenic stimulation in the presence of TGF-β and IL-2.8 Tregs suppress the activation of adaptive and innate immune cells through the contact-dependent and soluble mediators briefly reviewed here. Identification of Tregs in the postischemic kidney. 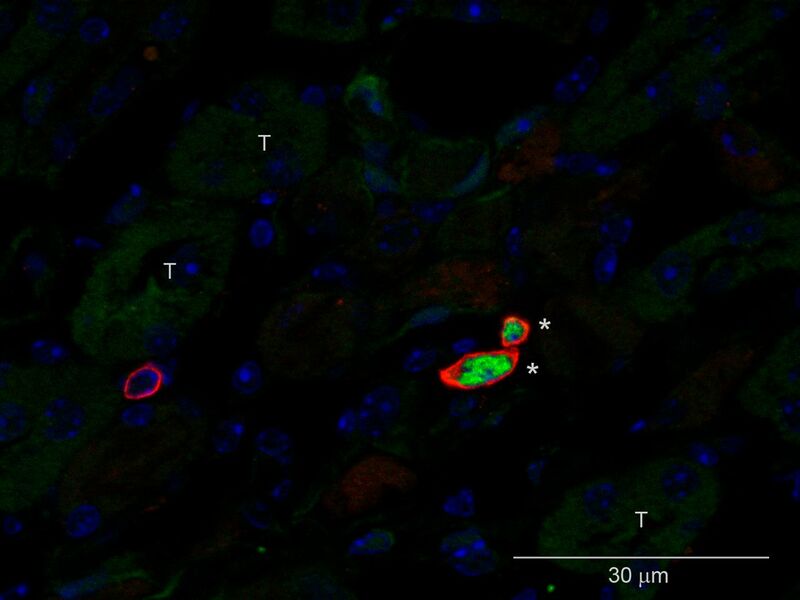 Immunofluorescence microscopy of a frozen kidney section 7 days after mild ischemic injury labeled with DAPI (4′,6-diamidino-2-phenylindole, blue), CD4 (red), and FoxP3 (green). T, tubules. *Tregs. Modified from reference 32, with permission. Under steady state, Tregs maintain close interaction with dendritic cells (DCs) through LFA-1/ICAM-1,9 LAG-3/MHC II,10 and Neuropilin-111 to inhibit DC maturation (in a CTLA-4–dependent manner)12 to prevent downstream immune responses. Another Ig-like molecule, T cell immunoreceptor with Ig and ITIM domains (known as TIGIT), which is expressed highly on Tregs, induces DCs to produce IL-10 and TGF-β for immune suppression.13 The ATP released from damaged cells induces DC activation and inflammation. Tregs express ectonucleoside triphosphate diphosphohydrolase 1 (CD39) and ecto-5′-nucleotidase (CD73) that convert ATP to adenosine,14 a molecule known to have anti-inflammatory effects through adenosine 2A receptors (A2ARs).15 Tregs can either directly kill activated immune cells through Fas ligand-16 and granzyme B-mediated17 mechanisms or induce cytokine deprivation-mediated apoptosis of activated T cells by IL-2 consumption.18 Additionally, Tregs secrete soluble mediators, including IL-10, TGF-β, IL-35, galectin-1, and fibrinogen-like molecule 2, for immune suppression.19 Constitutive expression of adhesion molecules (Integrin αE, CD62L, CD44, and selectin ligands) and chemokine receptors (CCR2, CCR4, CCR5, CCR6, CCR7, and CXCR3) enable Tregs to reach sites of inflammation,20 where they may directly suppress endothelial activation and leukocyte recruitment independent of their role in immune cell suppression.21,22 Lastly, Tregs transfer cAMP to activated CD4+ cells or antigen-presenting cells through gap junction intercellular communication to suppress target cell function.23 Thus, Tregs use multiple diverse mechanisms to suppress inflammation and autoimmunity (Figure 2). Tregs use multiple mechanisms to suppress inflammation and prevent AKI. Studies in mice have revealed that adoptive transfer of WT Tregs to WT mice protects against AKI, but Tregs isolated from IL-10 KO, CD73 KO, or A2AR KO mice are unable to fully protect the kidney.24,37 A2AR activation on WT Tregs enhances PD-1 expression and effectiveness in protecting against kidney IRI.37 Incubation of A2AR agonist-treated WT Tregs with a PD-1 blocking antibody (followed by washing) before adoptive transfer completely negates their ability to block IRI.37 Pharmacologic recruitment of Tregs to the kidney before IRI is beneficial in mice treated with isotype control antibodies but not mice treated with a CTLA-4 blocking antibody.41 CD39, ectonucleoside triphosphate diphosphohydrolase 1; FasL, Fas ligand; LAG-3, Lymphocyte-activation gene 3. *Critical mechanisms used by Tregs in AKI models; most of the other mechanisms depicted have not been tested in these models and may also contribute to Treg function (A). Modulation of Treg numbers in mice affects the outcome of acute renal insults and influences the rate and extent of recovery (B). Given the anti-inflammatory actions of Tregs and the critical role of inflammation in AKI, we hypothesized that intrinsic Tregs represent a vital component of the natural protective response to kidney injury. Two models of Treg deficiency were used to investigate this hypothesis. An anti-mouse CD25 antibody (PC61) was administered to selectively and partially deplete Tregs in naïve mice 5 days before mild renal ischemia-reperfusion injury (IRI).24 PC61 is widely used to study in vivo Treg physiology, but it should be noted that not all FoxP3+ Tregs are CD25+; therefore, PC61 only depletes ∼50% of FoxP3+ Tregs, and it takes ∼7 days after an injection of PC61 to achieve maximal Treg depletion.25 Because of these limitations, we also used T and B cell-deficient (RAG-1 knockout [KO]) mice reconstituted with lymph node cells from wild-type (WT; to replace T cells, Tregs, and B cells) or Scurfy mice (FoxP3-deficient mice; to replace T and B cells but not Tregs) before mild IRI. In both models, Treg deficiency resulted in enhanced renal inflammation, acute tubular necrosis (ATN), and loss of function.24 Moreover, this enhanced renal injury was reversed by the addition of isolated WT Tregs to the Scurfy lymph node cells in the RAG-1 KO model.24 In another mouse AKI model that was induced by cisplatin, Treg depletion with PC61 before cisplatin exposure also resulted in worse renal function and tissue injury compared with controls.26 Interestingly, in a cecal ligation and puncture sepsis model, Treg depletion with PC61 protected mice from renal dysfunction and improved survival.27 In summary, intrinsic Tregs protect from aseptic ischemic and nephrotoxic renal injury but may contribute to septic AKI. Ischemic preconditioning (IPC) is a powerful intervention to protect kidneys from reperfusion injury.28 IPC involves the exposure of an organ to a relatively short period (or periods) of ischemia, which subsequently protects that organ from more severe ischemia. A number of mechanisms contributing to preconditioning have been discovered, including changes in renal mitogen activated protein (MAP) kinase29 and adenosine receptor30 signaling. In addition, there is evidence that Tregs contribute to preconditioning.31,32 After renal ischemia, Tregs accumulate in the kidney,32,33 and we and others hypothesized that Tregs may be responsible from some of the protection induced by IPC. Treatment of preconditioned mice with PC61 to deplete Tregs before the second, more severe ischemia partially32 or completely31 negated the protective effect of IPC. Cho et al.31 went on to show that adoptive transfer of isolated Tregs to preconditioned Treg-depleted mice restored the protection. It would be interesting to determine if Tregs isolated from IPC mice are conditioned to prevent IRI compared with Tregs from non-IPC mice. In summary, these studies suggest that intrinsic Treg mobilization/activation is one of the protective mechanisms invoked by kidney IPC, which in coordination with intrinsic renal adaptations,29,30 leads to resistance against subsequent kidney injury. To test whether intrinsic Tregs also promote the recovery of renal function after acute injury, Gandolfo et al.33 administered PC61 24 hours after ischemia; Treg depletion after injury increased mortality and serum creatinine levels during recovery.33 The percentage of damaged tubules and proinflammatory cytokine-producing T cells in the postischemic kidney was significantly higher, and the reparative proliferation of tubular epithelial cells was lower at 3 and 10 days of reperfusion in PC61-treated mice compared with control antibody-treated mice.33 When PC61 was administered 24 hours before IRI (not far enough in advance to achieve maximal FoxP3+ Treg depletion at the time of injury), BUN levels and ATN were not different at 24 hours but significantly elevated compared with control antibody-treated mice at 72 hours after ischemia.34 Furthermore, administration of the immunosuppressant mycophenolate mofetil in WT mice but not T cell-deficient mice inhibited recovery from renal IRI.35 The impaired recovery from IRI in WT mice was associated with a dramatic reduction in Treg trafficking into the kidney.35 Taken together, these studies suggest that intrinsic Tregs traffic to the injured kidney to promote repair from ischemic injury. A very exciting clinical study was published in 2011 showing the feasibility and safety of ex vivo expansion of Tregs with subsequent intravenous infusion (adoptive transfer) at doses up to 3 million Tregs/kg to patients transplanted with umbilical cord blood.36 The results of several studies investigating adoptive transfer of freshly isolated Tregs before acute renal insults in mice have been encouraging.24,26 Tregs isolated from a naïve mouse spleen and then adoptively transferred to another naïve mouse (1 million Tregs per mouse) before IRI or cisplatin administration offer marked protection from renal injury and dysfunction24,26 and greatly enhanced survival.26 We tested whether clinically relevant doses of Tregs would be effective in the mouse model of IRI. Based on the calculation that 3 million Tregs/kg in a human would translate to 75,000 Tregs per 25-g mouse, we performed adoptive transfer of 40,000 Tregs per mouse before IRI and observed partial but statistically significant protection.37 Thus, adoptive transfer therapy with Tregs in humans is feasible and safe, and clinically relevant numbers of Tregs offer marked protection from ischemic injury in mice. To investigate the therapeutic potential of Tregs when administered after acute injury, freshly isolated Tregs were adoptively transferred at 24 hours of reperfusion.33 Treg adoptive transfer caused increased Treg trafficking to the postischemic kidneys, reduced effector T cell TNF-α and IFN-γ production in the kidney, improved ATN scores, and accelerated recovery of renal function as measured by serum creatinine levels.33 These findings are especially relevant, because in many clinical scenarios, AKI is discovered 24 hours or more after injury has occurred. Given the cost and technical challenges associated with Treg adoptive transfer in humans, a drug that could enhance Treg numbers, trafficking, or activity would be of great interest. Rapamycin and retinoic acid are compounds that promote Treg proliferation in vitro, and they could potentially be used to prevent or treat AKI38; however, some in vivo studies have shown that either Treg proliferation is not induced (with retinoic acid)39 or that, in addition to promoting Treg proliferation, other unwanted effects were observed (with rapamycin).40 Several recent preclinical studies suggest that other pharmaceutical agents target intrinsic Tregs and may be beneficial in AKI. Lai et al.41 observed rapid and transient trafficking of Tregs into the kidney on administration of dimethylsphingosine (DMS) in mice. If given 10 minutes before ischemia, DMS protected against IRI, an effect that was negated by prior PC61 treatment to deplete Tregs.41 DMS is a sphingosine kinase inhibitor; however, another more specific sphingosine kinase inhibitor did not produce similar results, suggesting that the mechanism is an unknown off-target effect.41 Sphingosine-1-phosphate analog (FTY720) enhanced Treg numbers in the spleen and kidney and protected mice from kidney IRI.42 Although the relative contributions of Treg enhancement and leukocyte sequestration for protection against IRI are debatable, PC61 pretreatment negated the protection induced by FTY720, and Treg adoptive transfer into PC61- and FTY720-treated mice restored the protective effect of FTY720.42 Recently, Kim et al.43 reported that bee venom increases Treg numbers in the spleen, enhances Treg trafficking to the kidney after cisplatin administration, and protects against cisplatin-induced kidney injury in mice. Importantly, bee venom had no adverse effects on the antitumor activity of cisplatin in the model by Kim et al.43 There are numerous other pharmacological agents that have been shown to boost Treg numbers or function in vivo (examples in Table 1). These studies suggest that pharmacologically targeting intrinsic Tregs in humans may be a promising therapeutic option for AKI. Very recently, two novel methods to target intrinsic Tregs in models of AKI have been published. The therapeutic effectiveness of adoptive transfer of mesenchymal stem cells (MSCs) was shown to partially depend on their interaction with splenic Tregs in recipient mice.44 MSCs induce proliferation of splenic Tregs in vivo and in vitro, and depletion of Tregs (with PC61) or splenectomy inhibited the protective action of adoptively transferred MSCs.44 In another study, IL-2/anti–IL-2 complexes were shown to expand spleen and kidney Tregs and protect from kidney IRI when given before the insult.45 In addition, these complexes promoted recovery and reduced fibrosis when given after kidney IRI.45 Thus, intrinsic Tregs can be targeted by pharmacologic, biologic, or non-Treg cellular therapies. As mentioned above, there are multiple ways that Tregs can suppress immune reactions. Tregs target some components of the innate immune response to injury, because the beneficial effects are seen within 1–3 days after injury; also, Tregs protect from AKI in mice lacking T and B cells24 and T cell–deficient mice.26 We have extensively investigated the mechanisms used by adoptively transferred Tregs and determined that IL-10 production,24 adenosine production through CD73, expression of the A2AR, and programmed cell death 1 (PD-1) on the cell surface37 are required by Tregs to protect recipient mice from IRI (Figure 2). CTLA-4–blocking antibody treatment negates the protection from IRI induced by DMS,41 suggesting that CTLA-4 is also involved in Treg-mediated defense against renal injury. Tregs generate extracellular adenosine by sequential CD39- and CD73-mediated dephosphorylation of ATP.14 Adoptive transfer studies showed that CD73 KO Tregs, which cannot convert adenosine monophosphate to adenosine, are unable to protect WT mice from kidney IRI.37 There are four different receptors for adenosine: A1, A2A, A2B, and A3. Tregs highly express the A2A receptor,14,37 and A2AR KO Tregs were also unable to protect WT mice from kidney IRI.37 Microarray analyses of WT versus A2AR KO Tregs and WT Tregs treated with an A2AR-selective agonist versus vehicle revealed that PD-1 expression is linked to A2AR activation in Tregs.37 Importantly, ex vivo pharmacological stimulation of the adenosine A2AR on Tregs, before adoptive transfer, enhanced their protective ability, such that postischemic plasma creatinine levels were no different than sham-operated controls in mice receiving 40,000 ex vivo–activated Tregs.37 The enhanced protective activity of A2AR agonist-treated Tregs was completely negated if those Tregs were incubated with a PD-1 blocking antibody before adoptive transfer. Thus, Tregs seem to make their own adenosine, which acts in an autocrine manner on A2ARs to promote Treg PD-1 expression and Treg protective activity in IRI. The role of Tregs in the pathogenesis of experimental stroke,46–48 myocardial infarction,49,50 ischemic liver injury,51–53 ischemic intestinal injury,54 and burn injury55 has been investigated. Many studies show that adoptive transfer of isolated Tregs is protective47,54,55; however, others do not.46,51 In addition, depletion of Tregs before injury has differing effects in different studies: exacerbating injury in some studies,47,54 having no effect in other studies,48,51,52 and protecting from injury in one ischemic stroke study.46 The reasons for conflicting results between studies in the same organ may be technical differences in the injury models (e.g., severity of injury in control mice) or methods of Treg depletion (e.g., PC61 versus diphtheria toxin-mediated depletion of FoxP3+ Tregs). Despite the controversies highlighted here, we are not aware of any studies that argue against the protective role of Tregs in models of sterile AKI. Although beyond the scope of this review, it noteworthy that Tregs show great promise in models of CKD, allograft rejection, and glomerulosclerosis.56 Adriamycin nephropathy,57 nephrotoxic serum nephritis,58 and lupus nephritis59 are all ameliorated by Treg adoptive transfer in mouse models. Overall, these studies show that Tregs constitute a vital natural defense mechanism against inflammation and extension of acute renal insults. Modulation of Treg numbers up or down leads to resistance or increased susceptibility to kidney injury, respectively (Figure 2B). Although some mediators used by Tregs in AKI models have been discovered, the target cells are unknown. Importantly, all of our current knowledge is from mouse models, and human studies are needed to understand the role of Tregs in clinical AKI. We hypothesize that Tregs themselves may be a novel therapeutic agent or that they may be targeted pharmacologically to block renal injury and/or promote recovery from AKI. In memory of Dr. Shyr-Te Ju for his lifetime of service to the scientific community and his help and advice on our studies of regulatory T cells in AKI. This work was supported by National Institutes of Health Grants K01DK088967 (to G.R.K. ), R01DK062324 (to M.D.O. ), and R01DK085259 (to M.D.O. ).